Please note that I favorited, retweeted and replied with a supportive comment. If you haven't done so already, go ahead and read the original thread in reddit - it's worth reviewing. I've wanted to write this post for the last few months, but every time I started, I've given up. The reason: fear. I've been afraid of what other EVE Online players might think about my particular point of view on this issue. I've been afraid of how they might respond. I've been afraid of what they might do - in game and out. I feel a bit ashamed now. I should have written this a long time ago. It took an inspiring tweet to motivate me to finally do it. For that, I owe the folks at Brave Newbies a debt of gratitude. What is the big issue I'm talking about? It's too much tolerance of some truly bad behavior in EVE Online. I can practically hear all the eyes rolling now. "Come on, Nev, get over yourself. This is EVE Online we're talking about here," I'm sure some of you are thinking, "It's supposed to be about bad behavior. That's what a lot of the game is all about!" We all love a good villain - especially in EVE Online. And I agree with that perspective - to a point. I actually like that horrible and terrible behavior is allowed in EVE Online - even encouraged. I read about players who earn players' trust, infiltrate a corp, and then pillage everything in a massive theft, leaving only an empty shell - and I smile to myself, and say, "Well done, dude. That took some skill." I admire these kind of evil deeds in the game - they impress me. It doesn't bother me a bit that carebears get ganked into oblivion in high security space. Or that players scam and lie and cheat and steal from other players, all day long. And I like that CCP Games doesn't interfere with this sort of brutal behavior - and in fact, condones and celebrates it. Actions have consequences in EVE Online. And I think that is a good thing. However, when player actions go beyond the allowed mechanics of the game - when they become vicious, callous, cruel, and over-the-top offensive - then I think that kind of behavior should not be tolerated. I'm not talking about obvious cases that cross the line between in-game behavior and Real Life behavior, like tracking down another player and terrorizing them in person. That is not just bad, it's criminal, and law enforcement should be called and the offenders prosecuted, whenever it occurs. I don't think many EVE Online players would disagree with that view. However, I see too much tolerance of players using language with the intention to attack, belittle and offend certain classes of people, or even worse, specific individuals. In fact, I have seen more than a few players who see that behavior as normal. And that disturbs me. Make no mistake - I can utter an occasional string of profanity just as blue as anyone. When used on rare occasion to punctuate an emotional point, a profane phrase can be effective, as James Joyce and J. D. Salinger illustrated masterfully. But when players make rudeness and vulgarity the standard for all regular discourse, it can move beyond profane into alarming. I'm disappointed when I hear people relying routinely on rapid-fire barrages of f-bombs and related curses in chats and voice comms, for no apparent reason - to me, that is just an indication of poor language skills. Much more troubling are slurs against certain religious beliefs, sexual orientations, or genders - specifically, insults against Jews, homosexuals and women, though these are not the only targets of unfair attacks that I've witnessed in EVE Online. For example, the casual use of the word "jew" to mean the avaricious gathering of wealth in EVE Online worries me. I asked one EVE player about it at Fanfest last year, after he mentioned "jewing" as something he does when he's not PvP'ing. I asked him if he thought that was an appropriate word to use. "Oh, I don't mean anything bad by it," he explained. "I'm not trying to offend anyone. When I use that word, it doesn't mean anything." Then why use the word at all, then? Why not say: "I have to go blartch for a while to make some ISK."? Wouldn't that suffice? No, it wouldn't - because the implied stereotype wouldn't be transmitted, and so it wouldn't carry the same impact. Words mean things. And words can be mean, regardless of whether one thinks they are or not. I could belabor this point further with additional examples of anti-gay slurs or of insults against female gamers, the latter of which I touched on in a previous post. But I think the point is clear: this kind of offensive language is used too much in EVE Online. It's true that EVE Online's unofficial motto is "harden the f*** up", which speaks to its challenging nature. Recently, a player in our corp replied "HTFU, dude! ", when I suggested he should use more refined language in our chat channel. When he refused, I banned him from the channel for a while, since profanity isn't allowed there under our rules. But I confess that I've seen other EVE Online players behaving badly, and I've said nothing. It's easier to simply let the offensive language slide, and convince myself that it doesn't really mean anything. But I know I'm just fooling myself, and I don't feel good about that. 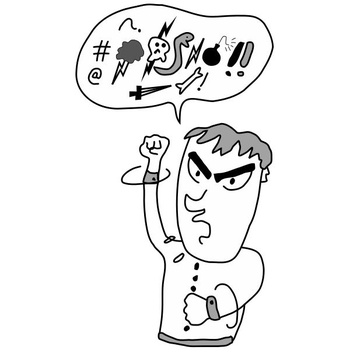 The users of offensive language say "HTFU" to justify their bad behavior. They insist that others tolerate what they are doing. But they forget that it goes both ways. "HTFU" also means that we should have courage to stick by our principles. And when colorful language morphs into the truly offensive, then it is up to the rest of us to simply say, "That's going too far." Actions should have consequences in EVE Online. That is a good thing, which we all should support. I'm a tolerant guy. I can be understanding with almost any point of view, but if there's one thing that takes me off my hinges it's the wanton harming of others through ignorance, insensitivity or pure malice. Kudos to you, Matias, and well said. I wish more corporations had this kind of policy in EVE Online. It's hard sometimes to stand up for the right thing, but you have done so bravely - pun intended. For what it's worth, I find that inspiring. As for me, I intend to act more courageously about calling out bad behavior when I see it. I urge anyone who reads this post to consider doing likewise. I think it would make EVE Online a much more enjoyable game - for everyone. Posted in Commentary and tagged with Brave Newbies, Bad behavior, Offensive language, Profanity, HTFU. November 23, 2013 by Neville Smit.